It is an honor to be voluntering at the American Cancer Society Coaches vs Cancer this Saturday night! I am working the silent auction! 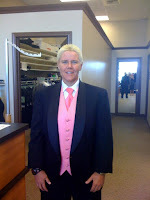 Loving my pink breast cancer Tux!